So, one of the easiest things you can do to simplify your home cooking is to buy a rice cooker. 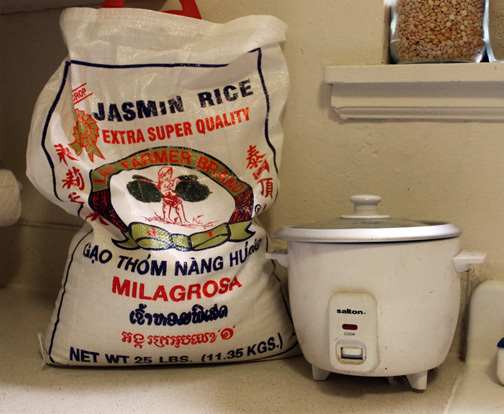 This article will give you a basic overview of how to use a rice cooker. While a rice cooker may seem like an intimidating investment – “I thought this was supposed to be cheap cooking!” – let me start by saying two things. First, I will periodically recommend products or tools I think will be useful. You do not, of course, need to buy these to cook at home, or even perform all the techniques I want to share. They will simply make your life easier. The more time you spend in your kitchen, the more you will want to expand your collection of tools. After a few key purchases, you will wonder how you ever lived without some of them. More on this later. Second, I will tell you that I paid $20 for a rice cooker at Bed, Bath & Beyond 5 years ago and it’s still working for me. It is beginning to have some glitches and “quirks,” but it still makes a good batch of rice. I can round out any meal with a quick push of a single button. I consider this rice cooker one of the best investments I have ever made for my kitchen. For those of you unfamiliar with how to use a rice cooker, rice cookers have two main parts – the rice cooker and a removable basin. The rice cooker should also come with a measuring cup for rice, and the inside of the basin will be marked with notches for water. (Be aware that the measure cup that comes with your rice cooker may not be an actual 8oz cup.) Measure the rice and the water, put them together in the basin, and then place the basin into the rice cooker. Once the rice cooker is started, it is designed to sense when all the water in the basin has been absorbed, and will either shut itself off or enters a warming mode, depending on the type of rice cooker you have. Which brings me to the next point – there are many different rice cookers available, that vary wildly in both price, build and features. You can buy ones that looks like a device from a space ship with different settings for all kinds of rices for upwards of $150, or you can find ones that have one lonely button on the front for under $30. As I said before, I paid $20 for mine and it has lasted five years. Where you choose to invest in that price range is up to you. So, for as little as $20, you can have a machine that will automate the cooking of a cheap staple grain – rice. You can find plain white rice in any grocery store across America. However, as more and more grocers implement bulk bins, you can often find a variety of rices for even cheaper. As good an option as the bulk bins are, I personally venture down to my local Asian market and buy a 25 lb. bag of jasmine rice for between $20 and $25. A supply like this can last me from three to six months. Your supply will vary with use, or course. So, if we’re keeping track of our costs here, let’s say you have spent $25 for your rice cooker, and maybe $25 for your giant sack of rice. For the combined cost of about $50, you can have a simple, nutritious grain to complement your meal that requires only a single push of a button prepare. It is also gluten free, for those of you with dietary needs, and it goes well with a variety of different cuisines. 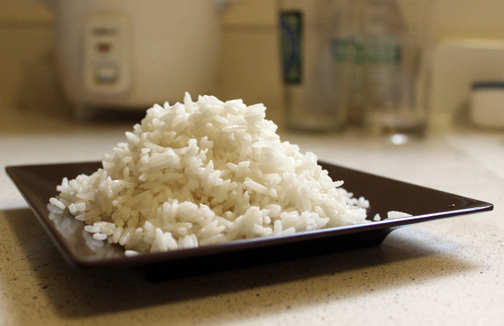 With every type of rice and rice cooker, there is going to be some adjustments to water levels. Short grain rice is going to require much less water than jasmine rice, while wild rice will take much more. I have yet to experiment with cooking other grains in a rice cooker, but I plan on researching this, and compiling a rough guide to water/grain ratios. This has the potential to be another great step in streamlined cooking. Now that I have given you a basic overview of how to use a rice cooker, we can move on to some interesting variations in making rice. As this series continues, I’ll give you some ideas and recipes for how to move beyond plain rice with just a little bit of extra effort. The links will be updated on this page for quick reference, or you can follow the blog for the latest updates. In the meantime, enjoy cooking! When you perform your experiments on other grains, will there be an easy way to find the post? Do you have a plan for tagging or something? I will tag it with grains and equipment, like this post, and it will probably be titled Rice Cooker, part 02, or something obviously sequential. I may also try to integrate hypertext into the blog for quick referencing. Thanks for asking. You are currently reading How to Use a Rice Cooker, part 01: an introduction at The Evolution of Eating.